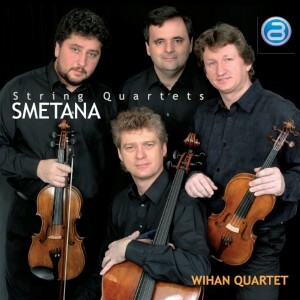 String Quartets - Bedřich Smetana - Mediální ohlasy - ArcoDiva management - Hudební agentura - Hudební agentura ARCO DIVA Management s.r.o. Smetana’s two string quartets were written in 1874 towards the end of his life, after the onset of sudden deafness due to syphilis. As with Beethoven’s last quartets they are deeply personal works that contain some of his greatest music. In my view they are at least the equal of any of Dvořák’s quartets. Both are in four movements and rather episodic in structure, the first is much better known and has an overtly autobiographical subtitle. More often than not it has been separated from its partner on disc and the present logical coupling in fine recorded sound is very welcome. The Wihan Quartet comprises Czech artists and has been established for more than twenty years. It has a solid international reputation. Back on home turf they prove ideal interpreters of this music. A loose programme for the first quartet was defined by the composer and the Wihan’s performance has stunning immediacy which brings it to life. The first movement’s viola solo is notably impassioned and the playing then develops opposing undercurrents of abandon and youthful idealism. The polka dances a wide range of emotions and the slow movement is deeply felt at a very slow tempo. After the cello’s rhapsodic introduction, the main theme is given with almost unbearable intensity. In the impassioned outburst which follows, this intensity is surpassed and, miraculously, yet again in the reprise. The finale comes almost as light relief apart from the intervention of first violin’s high E that represents the composer’s tinnitus. The ending is appropriately indeterminate and suggests that Smetana was here looking forward as much as backward.